Great news! After “six years and more than $65 million invested,” the hands-down best show on television has returned to bless me with its soothing delusions of American exceptionalism—and this time, it features Ashton Kutcher. And then there’s a woman crying, naturally, and then another woman crying, and Barbara saying, “You’ve got to give up this crying stuff. As soon as a woman cries, you’re giving up your power,” and then it cuts to a guy crying, so what about that one, Barb? 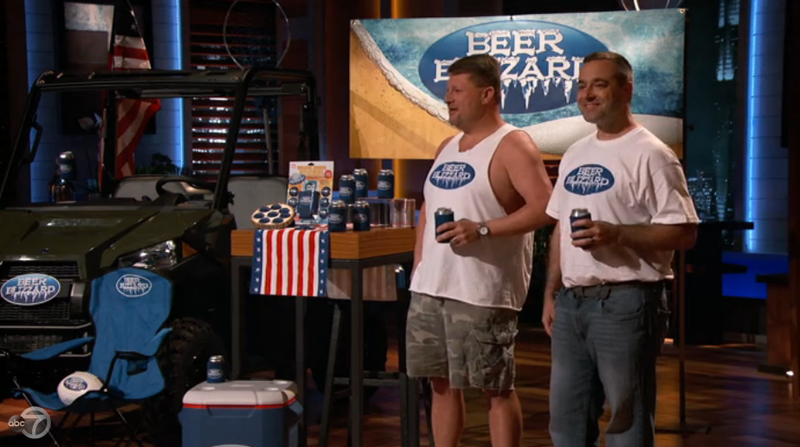 “This is the Shark Tank, we’re gonna kill you,” says Mr. Wonderful in utter nonchalance. Great! This season, there are three new sharks who’ll be switching in and out of the money seats. First, Chris Sacca, whose Wikipedia says he is “known for his signature embroidered cowboy shirts.” Then, Troy Carter, the music executive behind Lady Gaga, whose intro section clips him smiling as he says “There’s another kid in the garage that wants to eat your lunch”—why would the garage want to eat your lunch, Carter?—and, of course, there’s Ashton Kutcher, who my colleague Clover Hope suggested might become the Paula of the panel. Ashton Kutcher sits in what will now be known as Bro Corner, next to Cuban, and he brought pretty good vibes to this season premiere. The hue is a bit too Hot Fudge River to look natural, but I get it; he’s been going through a thing. Let’s get down to the products. What’s a Beebo? This is a Beebo. It allows you to do other things while feeding your baby, like, as the founder suggests, “caress your baby,” which, I guess. The Sharks point out that Ashton Kutcher is a new dad. “One of my favorite things is to feed her,” Ashton says. But he doesn’t want to go in on the deal because he’s “not helpful with manufacturing goods.” Good thing he’s on Shark Tank, then! After some fuss, because of his new-dad vibe and marketing connections, Ashton ends up splitting the deal with Lori. Robert decides to try them, careens helplessly off into the distance. “Where’s my camera,” says Lori in a very sincere and adorable way—forgetting, maybe, that all of this is being recorded for national TV. The founder of this company is very bad on television: evasive, dead-eyed smiling, insincere. He’s not sure how many skate guys he can produce in a month. He’s not totally sure what it costs to make each one. He wants to sell these for $500 at Target, and he wants $1 million for 3.5 percent, which is not a fun idea for any of the Sharks. “My gut tells me that you’re not really vying for a deal here today,” Lori says. He doesn’t get one and I hope I never see a pair of these in real life. Here’s a woman from Detroit who seems extremely competent and good. In the preroll, she talks about having a publishing company that went under in 2008; she and her husband lost their house but got back on their feet, partially via this “shrub”/“drinking vinegar” business. Drinking vinegars have been all over my issues of Bon Appetit lately, and her goal is to take these mass market—I’m guessing, like, to entice a new cocktail consultant at the head office of Applebee’s. The Sharks sensibly bring up the fact that, aside from apple cider vinegar enthusiasts, this is a category that has yet to be fully created or proven. Mr. Wonderful is, naturally, extremely rude about this, saying the market consists of “four guys and a dog.” Ashton Kutcher, having apparently never seen Shark Tank before, asks him to stop being such a dickhead. “You’re belittling people, and that’s NOT OK,” says Ashton. Ms. New Vinegar does not walk away with a deal. “Imagine I’m a hacker,” says the founder of the last company, who then simulates a hack on Cuban’s wallet. Signal Vault is a little card with a chip that you put near your credit cards, which’ll keep them, supposedly, from being hacked—the U.S. accounts for half the credit and debit card theft worldwide, okay, sure, but who will vault the signal vault? Doesn’t matter, because he can sell them for $14.95 and make them for 75 cents each. The Sharks’ eyes light up. “MAH MAN,” yells Ashton. This guy got his seed money from getting four out of five lottery numbers right—the inherent mythology of this show is amazing—and he seems good and nice, if, as is traditional, pretty nervous. “Yeah, because this is so similar to a lipstick box,” says Robert, who may well be Dark Robert this season. The entrepreneur asks the two of them to work together, and miraculously, gets his wish. All is well in the kingdom. We love you, America, good night. Images via NBC. Contact the author at jia@jezebel.com.